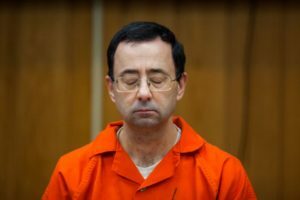 This episode contains audio from Day 2 Part 1 of the Sentencing Hearing of Larry Nassar, the 54-year-old USA Gymnastics team osteopathic physician and convicted child molester. This testimony, from January 17 2018, includes impact statements from the following gymnast-victims: Gina Nichols (on behalf of her daughter, Maggie Nichols); Tiffany Thomas-Lopez; Jeanette Antolin; Amanda Thomashow; Gwen Anderson; Amanda Barterian; Jamie Doski; Janelle Moul, and Madeline Jones. This was written by Mikita. Posted on at 11:15 am. Filed under . Bookmark the permalink. Follow comments here with the RSS feed. Both comments and trackbacks are currently closed.